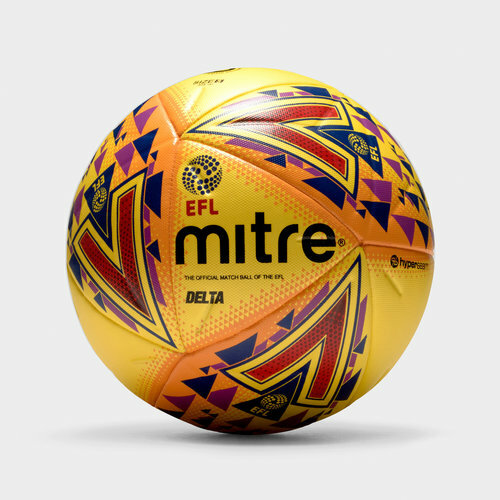 This replica football won't disappoint, enjoy honing in on your skills with the Delta Hyperseam 14 Panel EFL Official Match Football in Yellow, Purple and Orange. This ball developed for intense training and matches, becoming part of the team and helping develop skills you struggled with previously. The Durable outer and superior air-retention bladder makes sure it'll withstand use week in, week out - whatever the weather. Designed for play at the very highest level, enjoy improvement in all aspects of the game from passing, shooting and dribbling when you turn up to games and training with this official match ball.